Design Concept: The logo recreates the AIDS ribbon out of a bold geometric pattern inspired by the distinctively patterned baskets woven in many parts of Africa. Each basket is unique and the weaving of them is often a social activity. They are woven so tightly that they are able to carry water. In addition to their cultural and economic significance, the baskets are a metaphor for the power of a tightly woven community. Selection: In addition to the eye catching design, conference organizers selected John's logo because they were attracted to the idea of the baskets being watertight and used as a metaphor for ‘the power of a tightly woven community’. This same sense of solidarity and commitment - from community, leadership and science - has had a powerful impact on the HIV response. 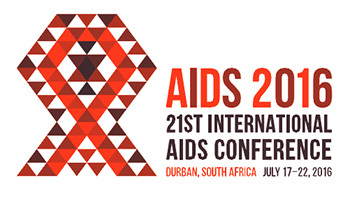 AIDS 2016 will celebrate this power and work to forge new pathways to overcome the epidemic.